The toy industry is extremely competitive with the number of brands and to make your product sell is a bit difficult. So, how can brands make their toys to stand out on the shelves?? The one and only answer is PACKAGING! Custom toy packaging makes the outlook of the boxes as exciting as the inside products. Owner of the toy brands who aim to influence children should know the importance of packaging. Having the right box design for your custom toy packaging can help you to get success easily. The toy packaging involves the needs of children and trust of parents. To attract the young customers, brands should try to be innovative with shape, colors, fun and playful aspects of custom toy boxes. Designing a perfect toy box is not an easy task and a design should consider a number of things. Here are some tips which can help you to do better. Before you start, consider yourself in place of a 10-year-old child. You have to think like a child thought towards toy packaging. Do your market research or ask children what they really want. Treat them differently from your adult customers. You cannot design a perfect toy box until you understand your customer's needs and demands. You can have weird or exciting shape boxes for Toy Packaging. But don't forget that your choice should be according to the structure and size of the toy inside. Colors, texture, and graphics are the formal aspects of toy boxes. Warm symphonic tones of colors are preferred by both child and parent regarding toy packaging. Bark and loud colors are not preferable as it can alarm the parents. When it comes to custom toy boxes, less is always more. Minimal and reduced packaging can benefit toy brands greatly. Offers parents complain about the effect of removing toys from inner packaging. So, try to design toy boxes with zero wrap rage. It makes easy for children to take the toys out. Less inner packaging can be a game changer for you. Everyone loves to know what they are going to have before buying the product. Most parents and children prefer to have the visibility of enclosed product before buying. A product's image cannot give a clear picture of what is inside. So, try to go for plastic window cutouts. It will give customers confidence in their purchase decision. Sometimes children get attracted toward a toy but parents are willing to buy it. They need surety that the toy packaging should be easy to use, age-appropriate and be engaging at the same time. So, your boxes should convince parents to buy the product by making a lasting impression. There are thousands of brands in the toy market who are competing for customer's time and attention. Custom Toy Boxes should be impactful enough to set your brand apart from the crowd. You can be unique with the colors, shape, and structure of the box. Your boxes should be unique in a sense that it should show your brand identity. Your toy packaging should communicate effectively about the product and the brand. So, it is important to highlight all the important aspect of your product on the boxes. Custom toy boxes should have information about what the product is all about and how to use it. Don't print the whole manual on the box. Just add few catchy lines to trigger customers. Make sure all information should be age appropriate. Toy packaging should be durable and sustainable. The box material should be strong that it keeps the toys from damage or breakage and the box should not deform or break easily. Also, make your packaging sustainable. When it comes to sustainability, most the parents prefer minimal packaging. This should follow by recyclable packaging and use of the green material. Kids love to have the surprise element in their toy boxes. They love to know what more is inside. You can increase their excitement by adding little puzzle games and free toy samples in the boxes. It will increase the value of the product and allow customers for the repeat purchase. It also helps to increase your sales and brand value. Custom toy boxes with different colors, graphics and high-quality printing help to make an impression on everyone. Toy packaging is not a child's play and you will definitely need a help of packaging professional. 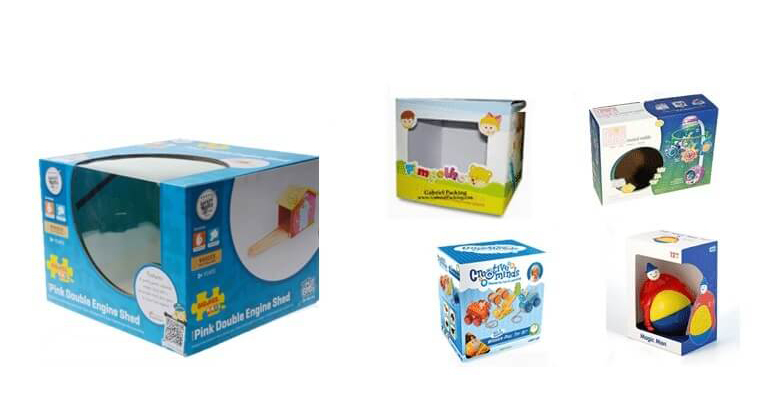 Custom Packaging Pro is completely aware of the children's need and parents concern regarding toy packaging. We design custom toy boxes in all size, shapes, and design which can help brands to stand out. We have boxes to package all kind of toys.